I’ve been on the prowl for coasters for what seems like months. About four years ago, I bought a set of coasters handmade from old Queen records backed with cork, but frankly they’ve seen better days. Aside from most readily available options being too cheap, too expensive, or just plain boring, my biggest hurdle has been the fact that I don’t really like coasters made of hard materials. The glass-on-glass sound of putting a ceramic mug down on a piece of tile? Just don’t like it. And the condensation: hard coasters always seem to get stuck to the bottom of my glass, where they threaten to fall to the floor and break, or land corner-first to dent your coffee table. Fact is, coasters made of soft, absorbent materials don’t have these kinds of problems. I was uploading some Instagram photos to Spoonflower as an experiment, thinking about sewing up some photo pillows for the new couch, when I realized that the photos were almost exactly 4 inches when printed… sounds like the perfect size for a coaster, doesn’t it? I’ll be posting the step-by-step instructions for this DIY in two different posts. First, we’ll talk about how to download your photos, assembling them into a photo collage, and finally ordering your fabric. Second, we’ll talk about assembling the physical stuff into a finished product. 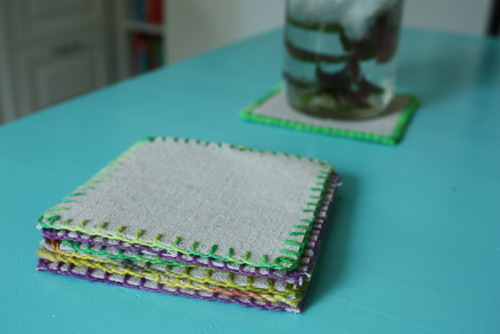 You get a lot of bang for your buck – this project will take you through making 28 coasters for about $20, assuming you have some scraps and other supplies already on hand. These would be great for a party (maybe even wedding favors), or you could make one set for yourself and make some for your best buds as gifts! If you don’t need 28 coasters, you can adapt these instructions to make 4 coasters for about $6, by ordering a test swatch instead of a fat quarter when it comes time to place your Spoonflower order. 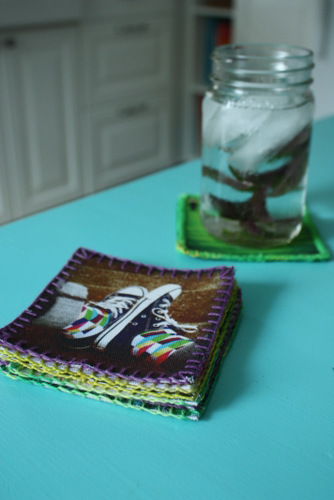 You can also use your custom fabric as both the front AND back fabric, to make 14 coasters with 28 different images. We’ll get started with the tutorial tomorrow, but you can get a head start by thinking about which Instagram images you want to use, downloading Google Picasa, and setting up an account as Spoonflower.